Present state: Station building is in residential use with little external alteration. Platforms demolished. Notes: The station opened with the line on 1 March 1847 and was originally called Netherton. The village and colliery of Netherton (usually spelt Nedderton today) lie about a mile east of the station. However on 1 January 1892 (or possibly one month earlier) it was renamed after Stannington village which was two miles to the south. This reflected the North Eastern Railway’s policy to avoid confusion with similarly named stations, even on other companies’ networks – in this case the Lancashire & Yorkshire Railway’s Netherton station on the Meltham branch (opened in 1869); another Netherton, on the Great Western Railway near Dudley, had closed in 1878. Located on the up (southbound) platform the station building displayed the customary dignity of Newcastle & Berwick Railway buildings. It was constructed of sandstone ashlar, and on the platform elevation the central feature was a corbelled-out gable with a two-storey bay, and on either side gabled windows graced the upper storey. Each gable was surmounted by a ball finial. Shelter was provided by short lean-to verandahs supported on wooden posts on each side of the central bay windows. The southern verandah was dismantled in NER days. A further ground floor bay was on the northern elevation. A single-storey section, whose pitched roof also ended in a gable with a ball finial, extended south of the two-storey structure. A waiting shelter was provided on the down platform. 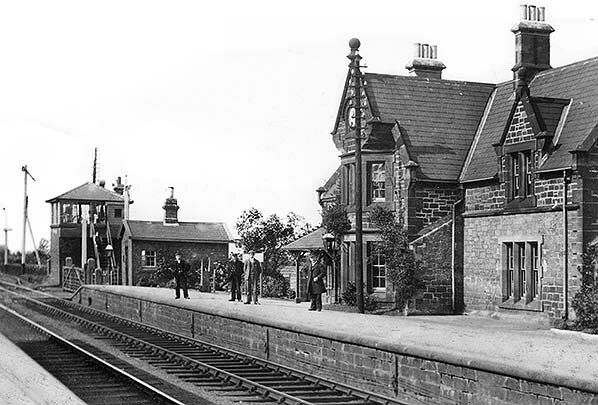 The surrounding countryside was sparsely inhabited, but this did not deter the Newcastle & Berwick Railway from providing such a grand station; further north, Longhirst and Lucker were two other stations which illustrated the company’s munificence. Perhaps the presence of Blagdon Hall, home of the White Ridley family, about three miles south called for superior station facilities – although Plessey and Cramlington stations were closer to the stately home. Reid’s monthly railway timetable of May 1849 shows the undernoted service, at which time the station was known as Netherton. At this date only Killingworth, Cramlington and Netherton were shown as intermediate stations between Newcastle (Carliol Square) and Morpeth, although Heaton is known to have been open at this time. Early public timetables for the north-east England omitted a number of stations: the Newcastle-North Shields line (on which Heaton originally opened) was a case in point. In February 1863 Bradshaw indicates that the passenger service was still infrequent. The Ordnance Survey plan of 1883 indicates that at least one siding south of the station, with a trailing junction from the up line, was installed at the station, which was still called Netherton. No goods shed was built. The station had little population in its vicinity. The Railway Clearing House Handbook (1904) indicates that Stannington could handle the full normal range of goods traffic but did not possess a yard crane. NER records of 1913 show that sanitary tubes, hay/clover and livestock (50 wagons dispatched) were the principal goods handled. In 1911 the local population amounted to 800 and 14,968 tickets were booked. The timetable, below, from shortly before World War I shows a fairly frequent, though irregular, service which provided suitable trains for a shopping trip into Newcastle on all weekdays; however, the convenient morning trains for workers in Newcastle were not balanced by well-timed returns in the evening rush hour. At this time there were still few residents in the vicinity of Stannington station. In January 1923 the North Eastern Railway became part of the London & North Eastern Railway (LNER) in the ‘Grouping’. Stannington station continued to enjoy a reasonably frequent service; the morning train advertised as terminating at Beal was a durable feature seen in both the NER 1912 and LNER 1937-38 tables. The LNER invested little in the station but did install its standard running-in boards of metal letters pegged to a wooden board. The outbreak of war resulted in a severe curtailment of advertised weekday services, but two up and one down train would have been suitably timed for people working in Newcastle. The opening of the Benton NW curve enabled some local passenger trains to be diverted from the main line through Heaton Junction, avoiding a likely target for enemy bombs, and freeing up that part of the main line for freight traffic. However, soon after the war most services reverted to travelling via Heaton. Shortly before the war some disjointed ribbon development had taken place on Stannington Station Road, but insufficient to provide much more business for the station. In January 1948 at Nationalisation the station became part of British Railways’ North Eastern Region, and the train service was little altered by the new operator. BR made no significant changes to the station, with oil lighting and the LNER running-in boards retained, the latter repainted in NE region tangerine. 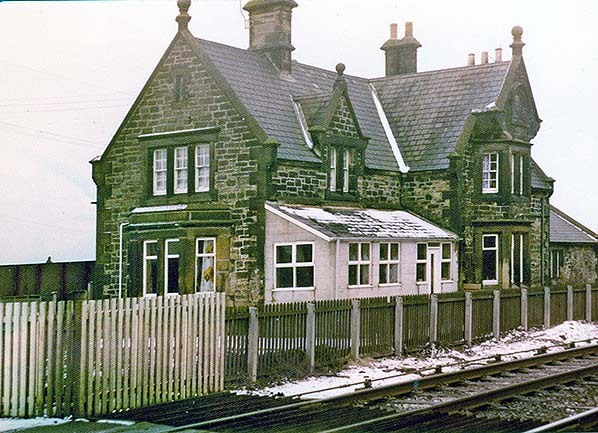 The use of Stannington station declined, with only 527 tickets booked in 1951; this trend was repeated at the other minor ECML stations in Northumberland. In June 1952 Stannington (and its neighbours) suffered a reduction in services, as shown below. Stannington is the first stop made by the down train indicated with the asterisk. The solitary Sunday evening train call was discontinued in September 1957 when the winter timetable began. The final season’s timetable (summer 1958) showed southbound departures at 8.09am, 10.57am (Saturday only), 4.38pm (Saturday only) and 6.12pm (Saturday excepted). Down trains called at 7.55am (to Berwick), 12.58pm (Saturday only) to Alnwick, and at 7.06pm (Saturday only) to Berwick - the first call made by this train after departure from Newcastle. Closure to passengers took effect on 15 September 1958, after which only Cramlington station remained open for passenger traffic between Heaton and Morpeth. Goods traffic continued to be handled until 10 August 1964, and the sidings were later removed. With the reduction in local stopping services the passing loops for passenger trains north of Stannington were taken out of use on 25 June 1967. The station signal box, which had opened in 1873, worked conventional crossing gates until March 1972 when they were replaced with barriers. The box closed on 3 March 1991, but the base was retained as a relay room. 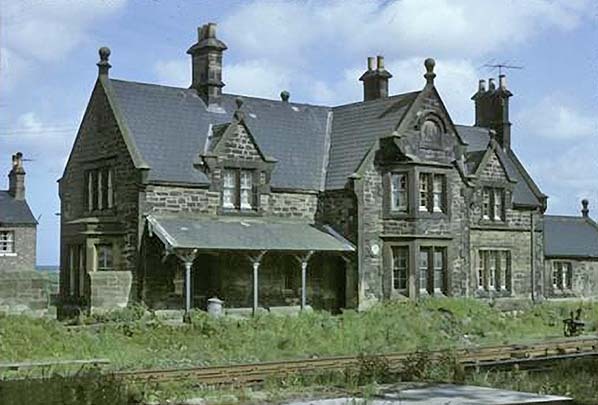 Although the platforms and the down side waiting room were demolished by the late 1960s the main building of 1847 has survived, in residential use. It is the only one still standing south of Morpeth. Route maps drawn by Alan Young. Tickets from Michael Stewart. The up platform of Stannington station looking north-east from the down platform before July 1905. The dignified Newcastle & Berwick Railway building of 1847 has already lost its southern verandah; its former position is indicated by the area of masonry which has not been darkened by soot. The goods office adjoins the platform ramp, and the signal box – opened in 1873 – is beyond the level crossing. 1859 1:2,500 OS map. The station is known by its original name of Netherton which it carried until 1891/92. A single siding is provided at this time. The locality is sparsely populated, with the hamlet of North Moor adjacent to the station. 1897 1:2,500 OS map. The station is now called Stannington. A terrace of railway cottages has been built alongside the station approach road. 1922 1:2,500 OS map. A second siding has been added, the two sidings running either side of a dock. 1961 1:2,500 OS map. The station is now closed to passengers, but some more housing has appeared in the locality in the form of disjointed ribbon development along Stannington Station Road. The station building at Stannington looking east in June 1966. The platforms have been demolished but the building has been retained and is in residential use. 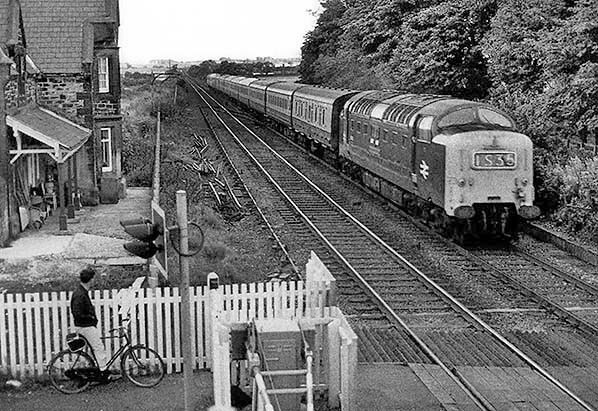 Stannington station seen from a passing train in September 1972. Stannington station, looking south from the signal box on 27 August 1974. The northern verandah is still in place and used for storage. Beyond the building the goods loading gauge is extant. The 14:00 London Kings Cross to Edinburgh Waverley is hauled by Deltic 55016 (formerly D9016) ‘Gordon Highlander’. Since its withdrawal in 1981 the locomotive has been owned, or hired, by various organisations including the Deltic 9000 Fund, Porterbrook Leasing, and the East Lancashire Railway. In March 2014 it arrived at the Great Central Railway. 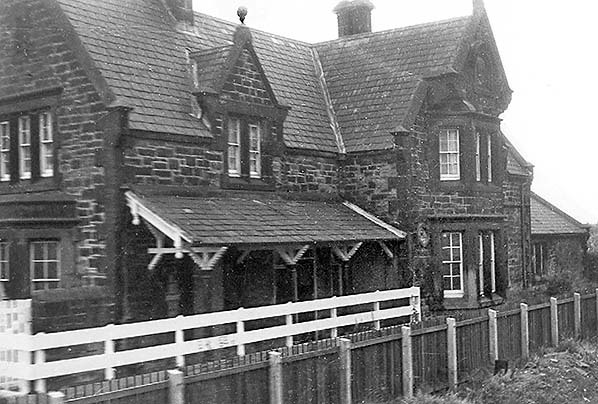 Stannington station building seen from the level crossing in 1977. The lean-to extension occupies the position of the northern verandah which is seen in the two pictures above.